What are the easiest garden plants to grow in the fall and winter? In this article, we’ll help you figure out how to keep garden-fresh produce on the table no matter how cold and dreary it is outside! 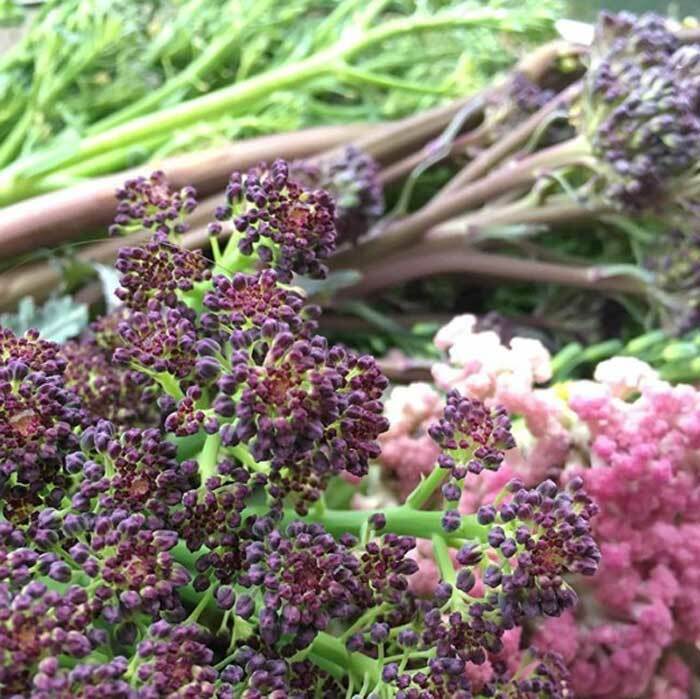 A beautiful head of purple cauliflower growing in your fall or winter garden is sure to cheer you up on a cold, dreary day. For most of us, gardening is a seasonal activity. We dig our tools out of storage in early spring and put them away for the winter shortly after those mountains of autumn leaves become fuel for a bonfire, or better yet, compost. 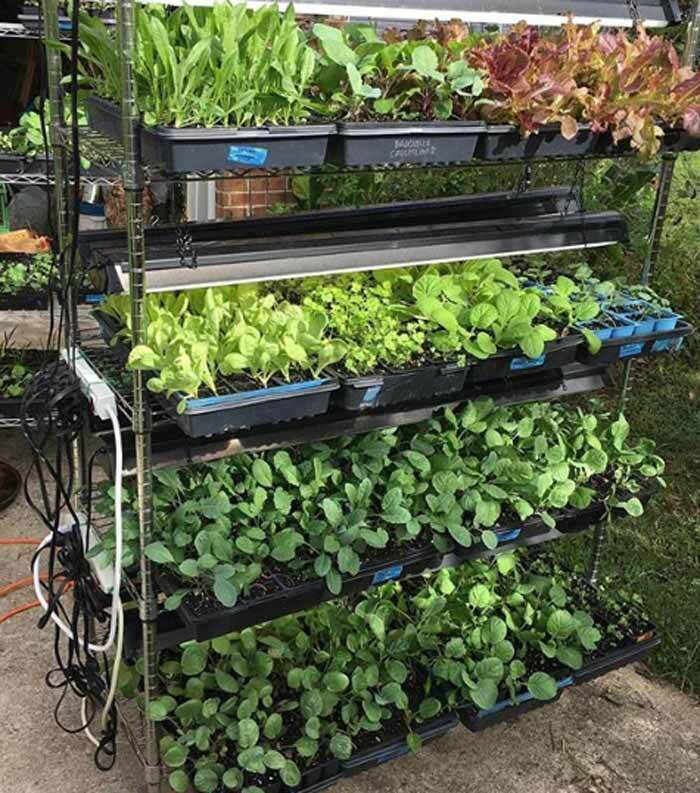 That’s right, unless you garden where the weather consists of punishing cold sub-zero temperatures, you can raise vegetables straight through, from fall until spring. 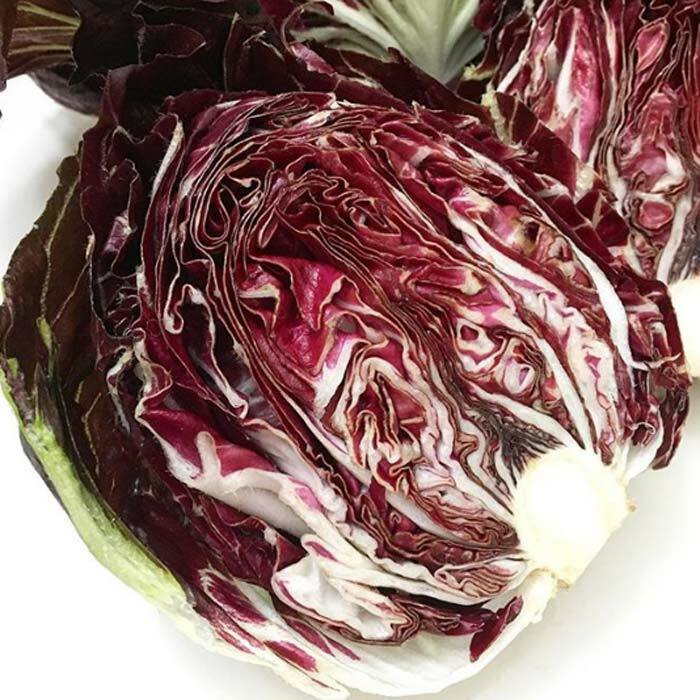 ‘Red Orchid’ radicchio, a variety of chicory, harvested from our winter 2017 garden. 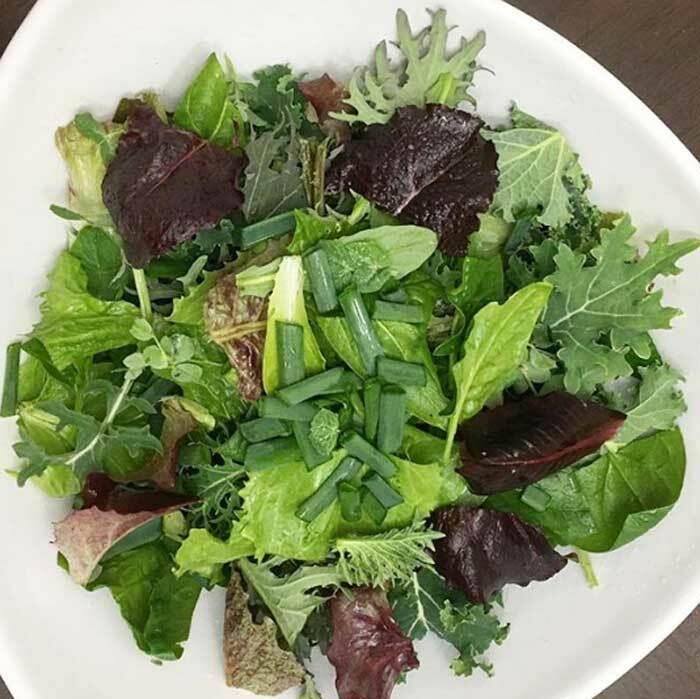 These beautiful, nutrient-rich greens were added to a mixed green salad with nutritional yeast and a balsamic-olive oil dressing. 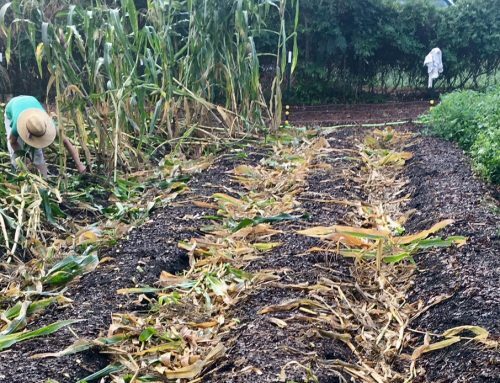 You don’t need to be a master gardener to grow vegetables during the cold “off seasons.” In fact, cool/cold season gardening is an ideal project for experienced planters as well as those who are newcomers to the gardening world. Kale yeah! ‘Dazzling Blue’ kale looking beautiful on a fall day. Reduced pest insect pressure – Most insects pests are safely tucked away until spring, meaning you don’t have to stress about insects eating your plants. Reduced disease pressure – Likewise, many plant pathogens and diseases are dormant in the cold months as well. 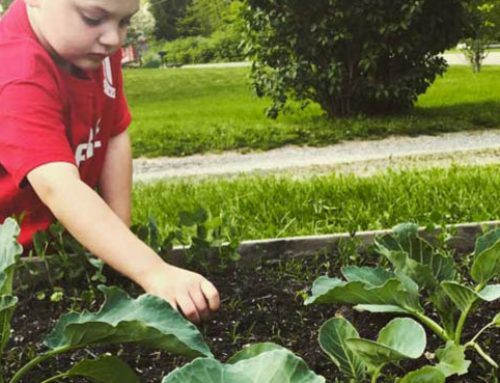 Top-dressing your garden beds with good compost before planting helps introduce beneficial fungi, bacteria, and other microbes that help to further reduce or even eliminate disease pressure all together. If you start doing a lot of fall and winter gardening, you may also want to start making your own probiotic sauerkrauts in a fermentation crock. In short, just because it’s cold outside doesn’t mean there aren’t lots of edible plants that you can grow in your garden – and you may even find that you like fall and winter gardening better than warm season gardening! What are the easiest garden plants to grow in the fall and winter? There are literally hundreds of viable plant choices for edible gardening during the cold months. Deciding what to grow is mainly a matter of personal preference. This way, you don’t get bored with what’s on your dinner plate. You also get more nutritional diversity, which translates to a broader range of vitamins, minerals, and micronutrients. 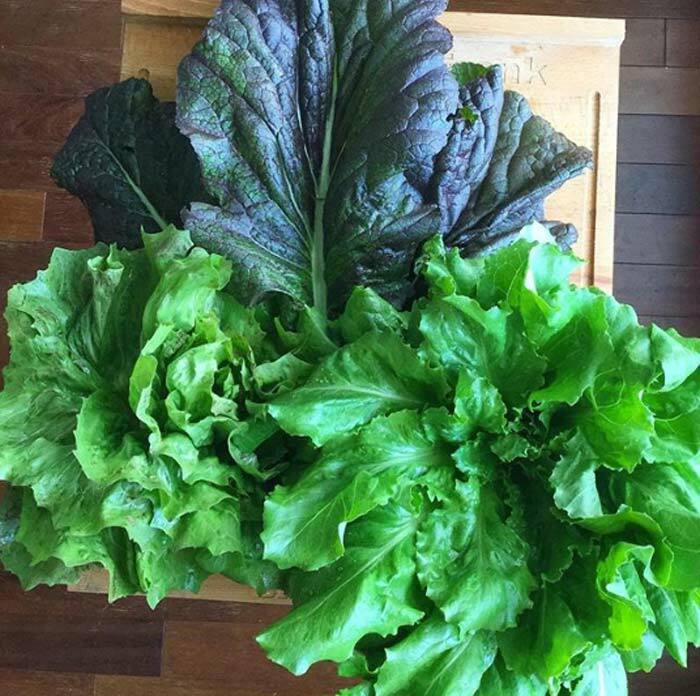 Mustard greens, lettuce, and chicory harvested on a freezing cold day. Finally, keep in mind that one variety of the same plant may be more or less cold-hardy than another variety. For instance, some varieties of kale can survive uncovered into single digits, whereas other kale varieties will die when temps go into the teens. So when selecting seedlings or seeds, pay attention to the description and relative hardiness of each variety. 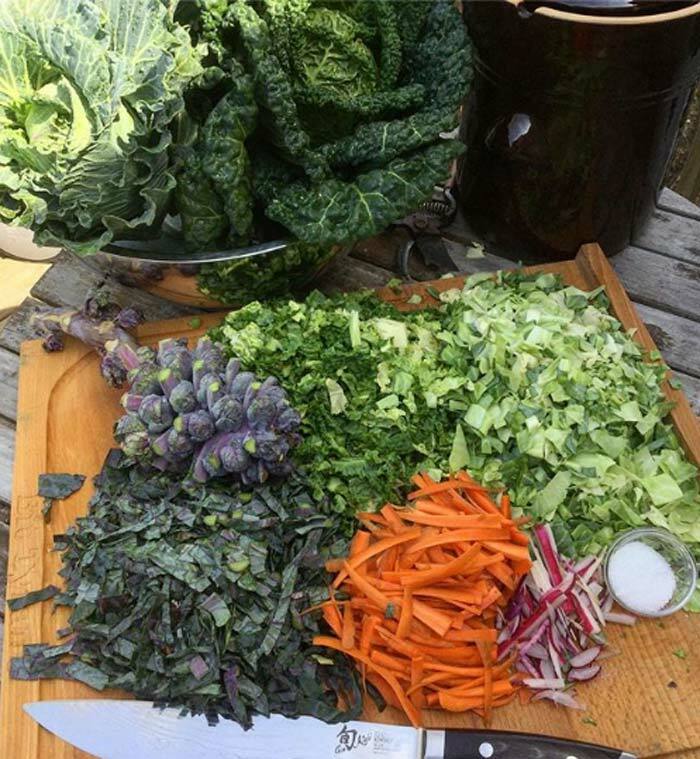 A beautiful sampling of some of the leafy greens you can grow in your fall and winter garden, including different varieties of kale, spinach, lettuce, chicory, and even wild chickweed! 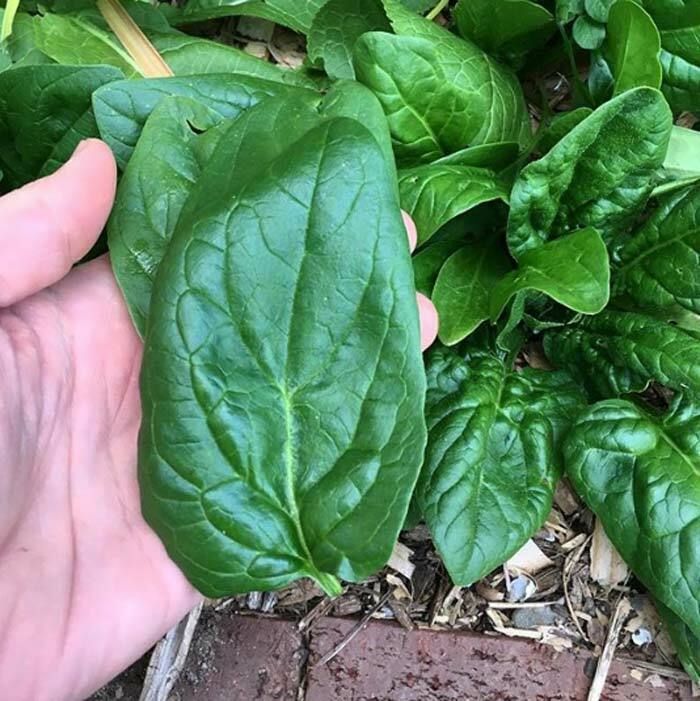 Spinach is a very fast-growing, cool weather vegetable. We’ve had spinach survive uncovered down to single digits (although it stops putting on new growth at these temps). You can even plant spinach seeds in a pot near your kitchen door. Fill the pot with a good quality potting mix, and of course, be sure the pot has a good drainage hole in the bottom. Sauté that fresh spinach in a little butter or olive oil with diced garlic. Or eat it raw in spinach salad. The ideas for using fresh spinach are endless. 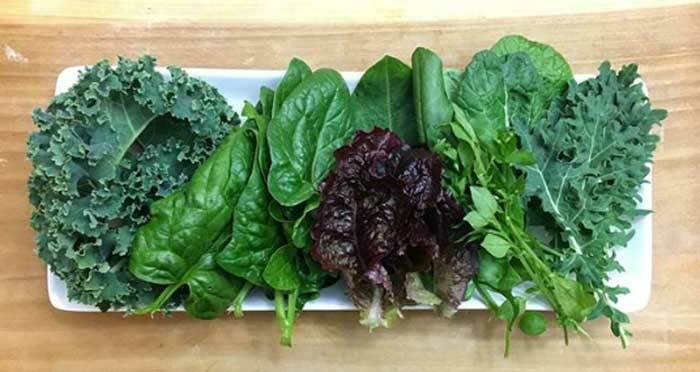 Fresh spinach tastes so sweet and delicious after a freeze! 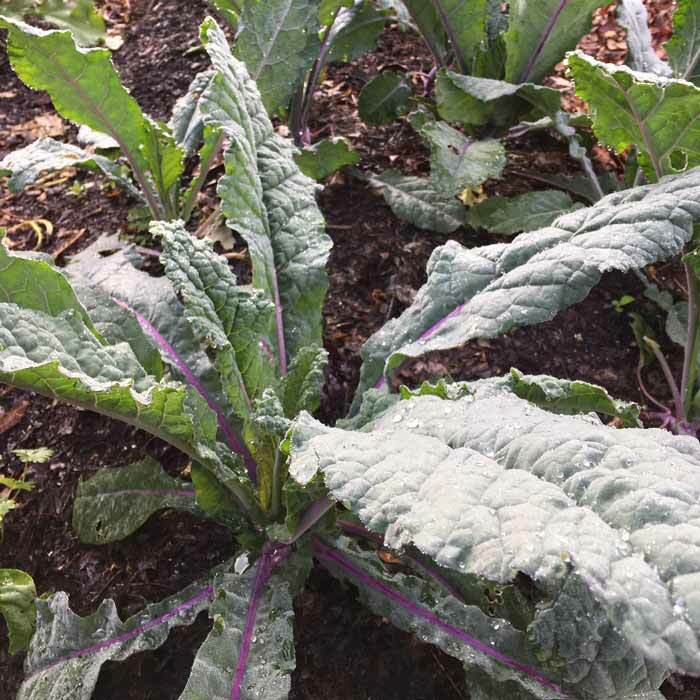 Kale – There are sooo many different wonderful kale varieties out there, and our cold weather garden is always loaded with kale. Some of our favorite varieties: White Russian, Red Russian, Lacinato, Dazzling Blue, Blue Curled Scotch. ‘Bear Necessities,’ a strikingly beautiful kale variety we tried for the first time in 2017. Chicory – A truly under-appreciated leafy green in the US, but very popular elsewhere in the world. Chicory’s slightly bitter leaves are best in the cold months when they sweeten up. Like other cold weather garden plants, chicory uses sugar as a cellular anti-freeze, which is why it tastes better harvested after cold weather. 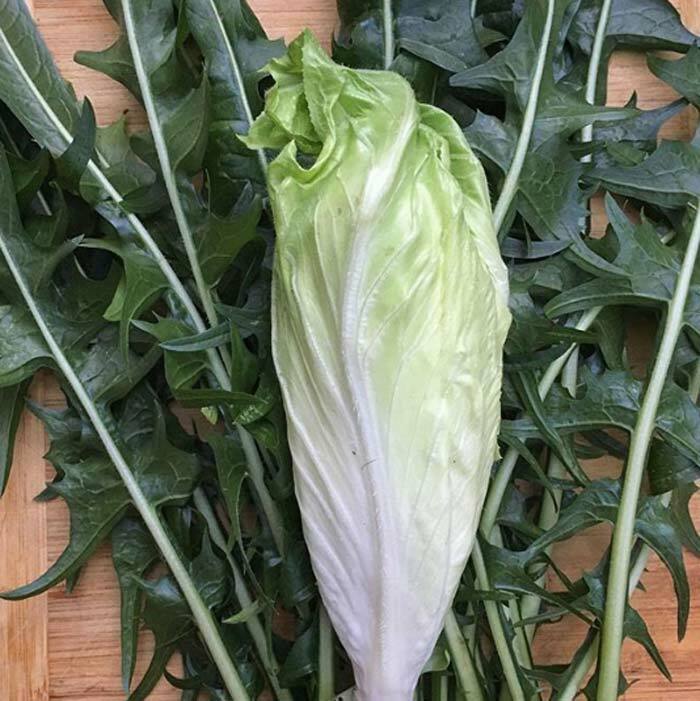 There are chicory varieties grown for their frilly leaf greens, to be harvested as heads (like a small cabbage), and even for their edible roots. Not quite as cold-hardy as spinach and kale, but still worth growing. Chicory comes in an amazing array of sizes, shapes, and colors. 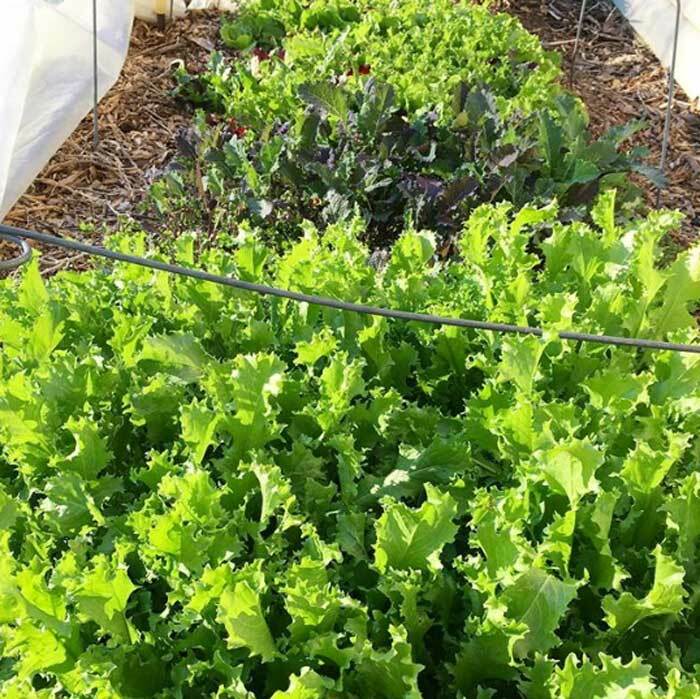 Lettuce is probably the least cold-hardy plant on the “leafy greens” list, but will generally tolerate light frost. As with the other plants on this list, there are varieties of lettuce that have been bred to be more cold-hardy than others. Arugula is a spicy salad green that some people don’t care for, but we happen to love. We add it to cooked dishes (like lasagna). We also eat mounds of raw arugula in mixed green salads or by itself (this homemade vinaigrette dressing cuts arugula’s natural heat). 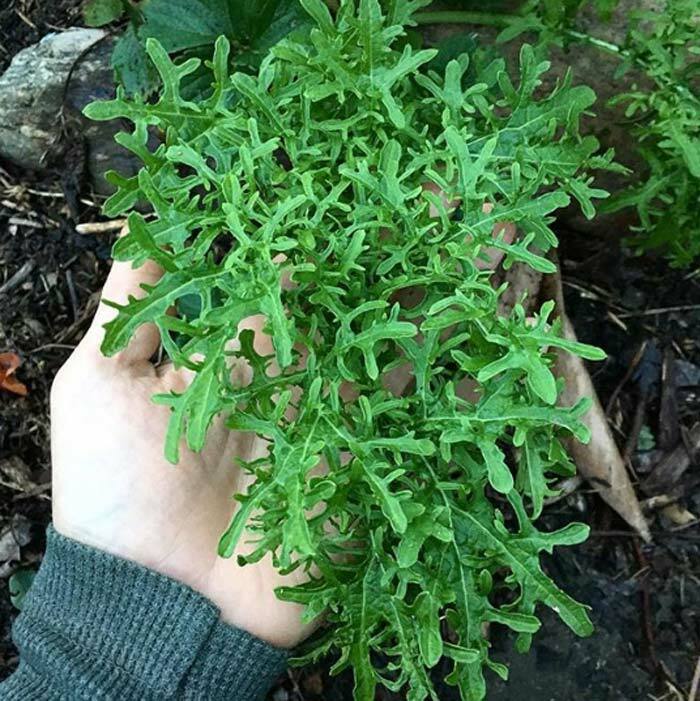 ‘Astro’ is the probably the most popular annual variety of arugula, but we love growing Sylvetta arugula as well, a low-maintenance perennial that will live for 3-5 years. 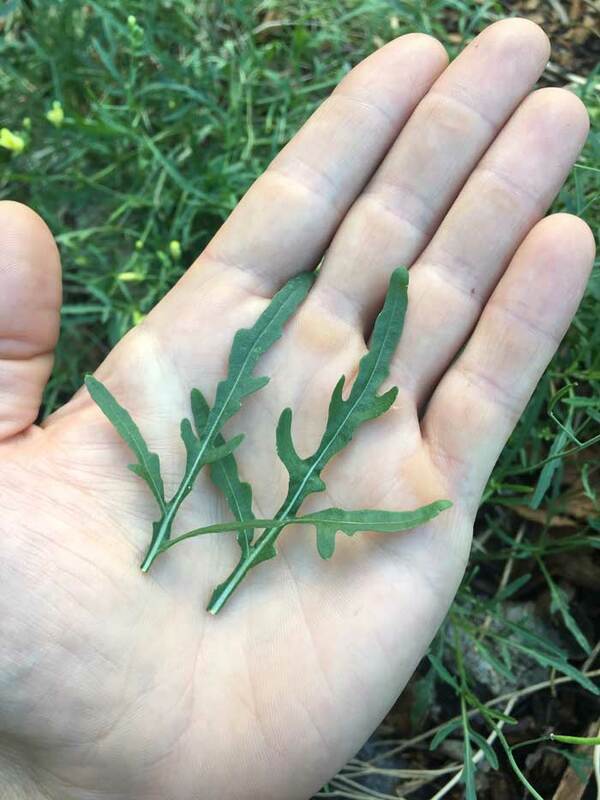 Both types of arugula will die in deep freezes, but Sylvetta will grow back as soon as temps start warming in late winter-spring. It does readily re-seed so be careful! 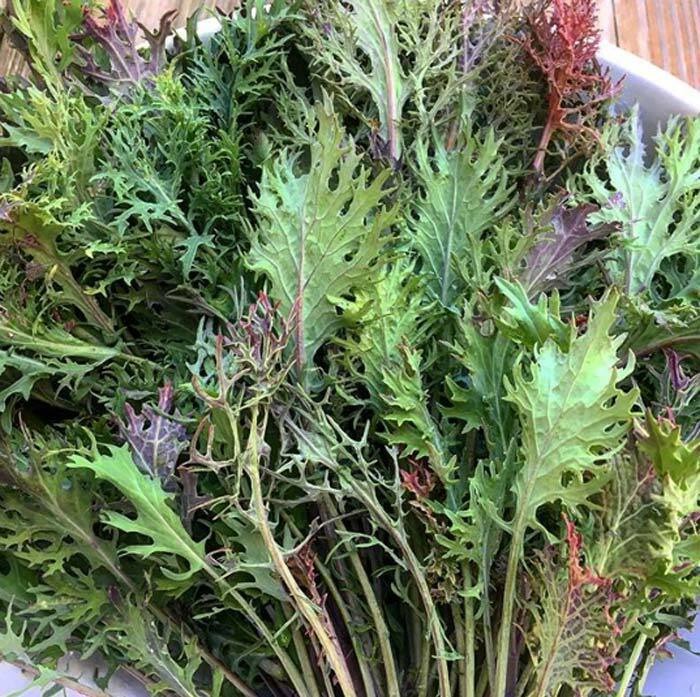 Beautiful, lacy Sylvetta arugula leaves pack an incredibly intense flavor and are considered to be one of the most nutrient-dense greens in the world. Austrian Winter pea shoots should be grown in every winter garden. This variety is much more cold-hardy than other peas and it’s tender growth tips taste as good as if not better than sugar peas. 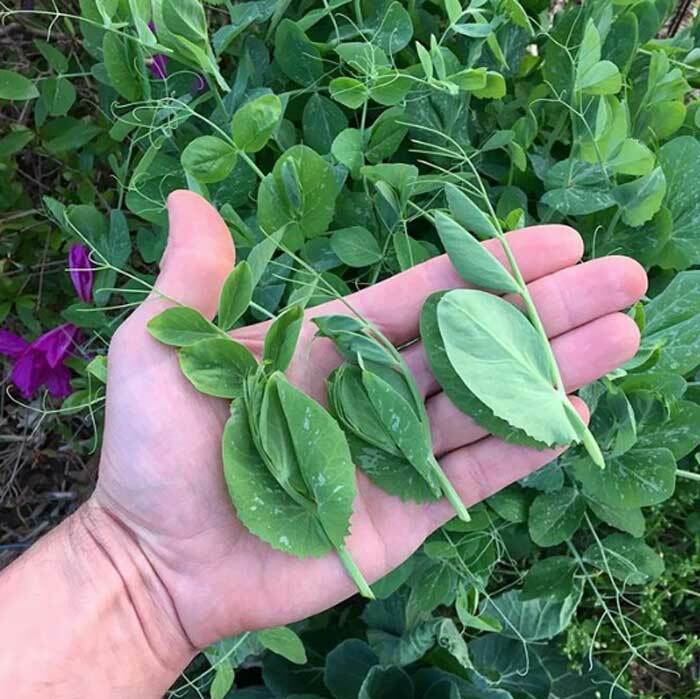 As it warms up in late winter and spring, the plant produces flowers and peas as well, but the peas are better for soup than fresh-eating, hence why it’s in the “leafy green” category. Austrian winter pea shoots are a winter green that have the texture of soft lettuce and the flavor of sugar snap peas. Collard Greens are a winter staple in the south. They’re also part of our region’s New Year’s tradition – southern folklore has it that eating collard greens will bring you financial luck in the new year. Now that’s a beautiful leaf! ‘Golden Frill’ mustard. 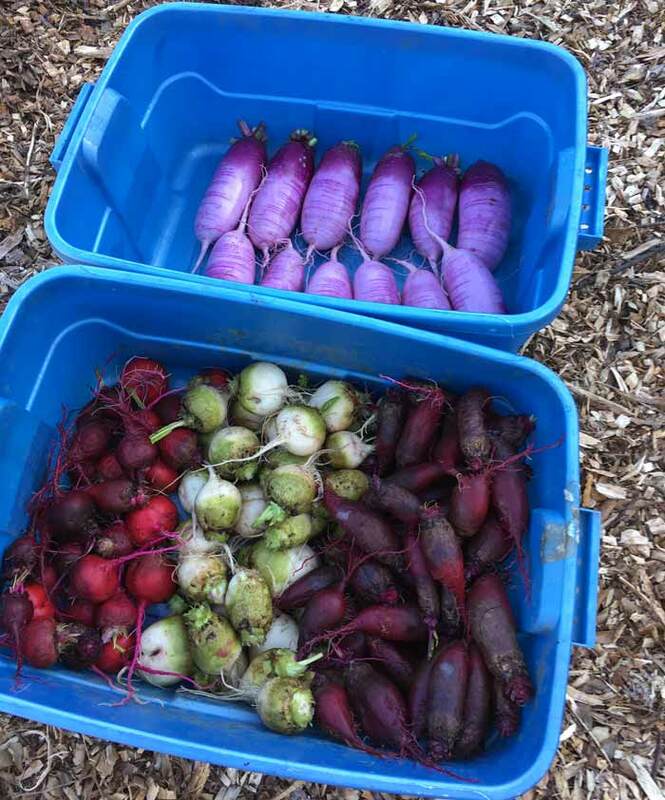 A beautiful assortment of cool weather root crops: radishes, beets, and turnips. *Our favorite way to cook fall and winter roots is to rough chop them, put them in a bowl, toss them with olive oil, salt, and garlic powder, then roast them in the oven on 375° until softened and slightly browned. We often use all four root crops listed below in the same batch of root veggies, with the addition of onions, garlic cloves, sweet potatoes and/or white potatoes. So good! Carrots – Who isn’t familiar with carrots since they’re in every grocery store throughout the year? So why grow carrots? When you grow them in the cool months and eat them soon after harvesting from your garden, the flavor is so much better than what you get from a grocery store. Our recommendation: grow heirloom carrot varieties and also grow different colored carrots: orange, red, purple, yellow, etc. 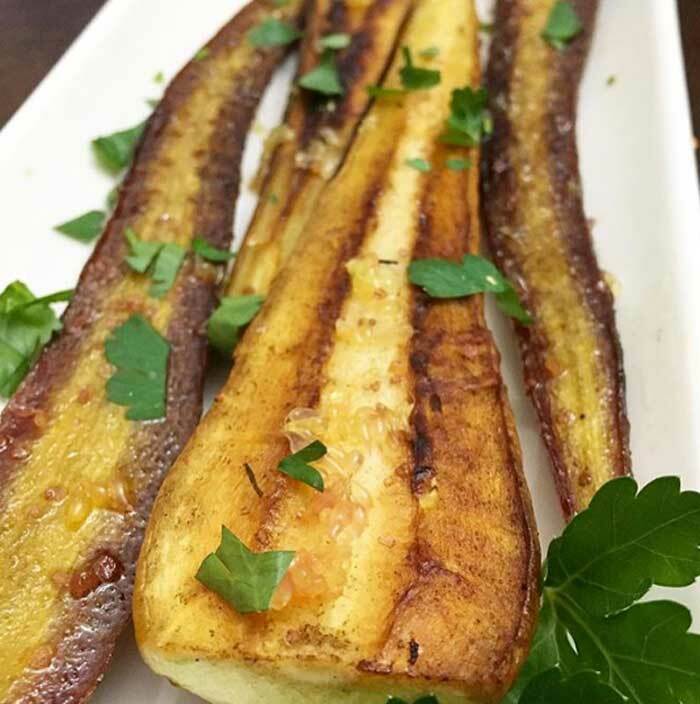 Parsnips – We think parsnips should have far greater popularity than they currently do. A close relative to carrots, but with a distinctive, sweet-earthy flavor that is divine. Only downside: they take longer to mature than carrots so you’ll need some patience. 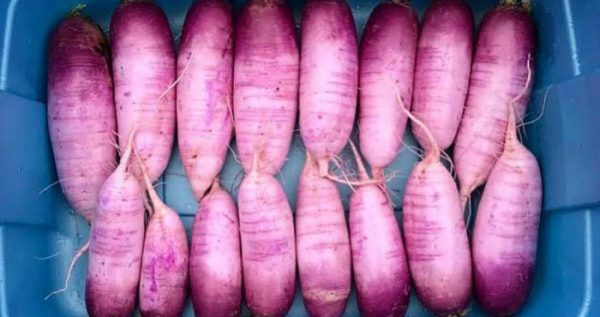 Turnips & Radishes are garden and farmers market staples for good reason. They’re easy to grow and fast growing, with some varieties yielding a harvest in as little as 30-45 days, which makes them an awesome choice for succession planting. ‘Tokyo Market’ turnips, a fast-growing and delicious turnip. 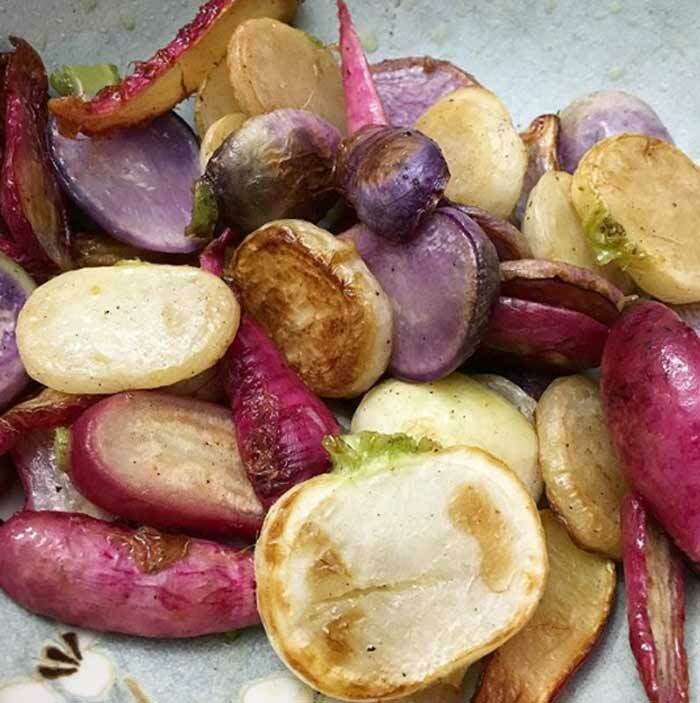 Rutabagas are similar to a turnip, but with a more nuanced, sweeter flavor. Personally, we like them better than turnips from a flavor standpoint. 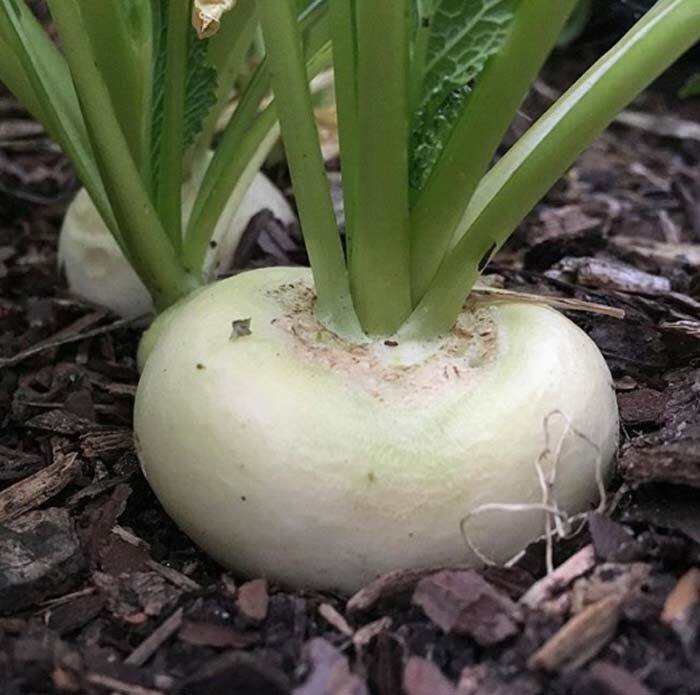 However, as with carrots vs parsnips, rutabagas generally take much longer to mature than turnips (especially salad turnips). Roasted root veggies: a fall and winter favorite. 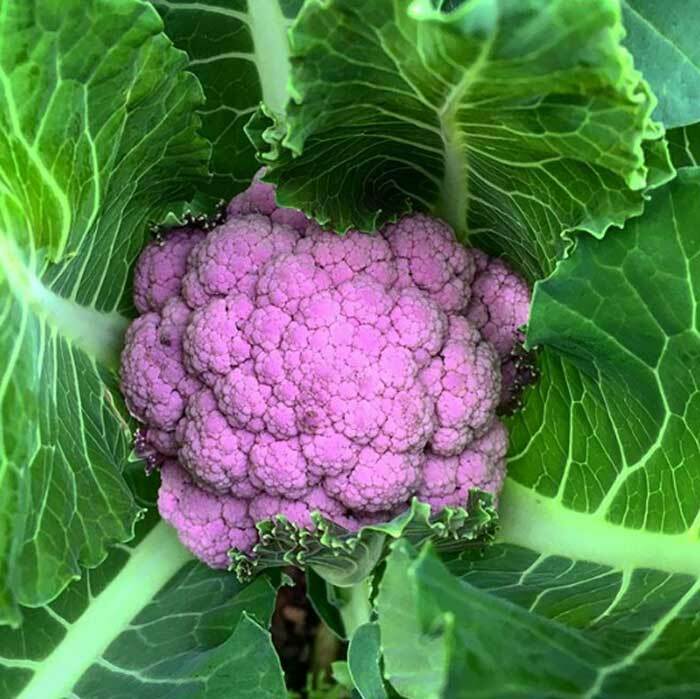 Cauliflower and broccoli are fantastic choices for cool weather gardening. Don’t just think white cauliflower and green broccoli. Cauliflower comes in a wide range of colors, from purple to orange. There is also purple broccoli. Another great feature of both of these plants: the leaves are edible and quite delicious braised or raw. Don’t harvest too many of the leaves, however, as this will take away from the plants ability to put energy into forming florets. 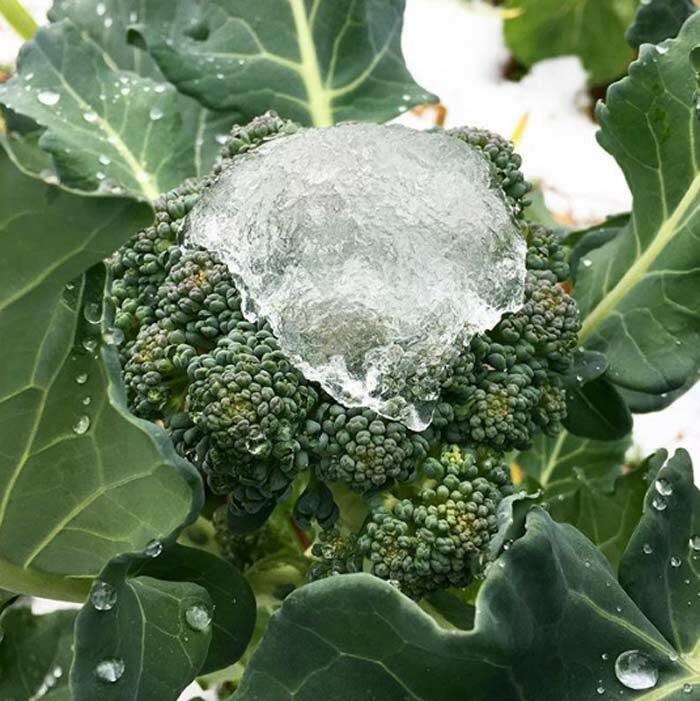 Broccoli floret under melting snow. Parsley is another super cold-hardy plant that packs a load of flavor and nutrition. 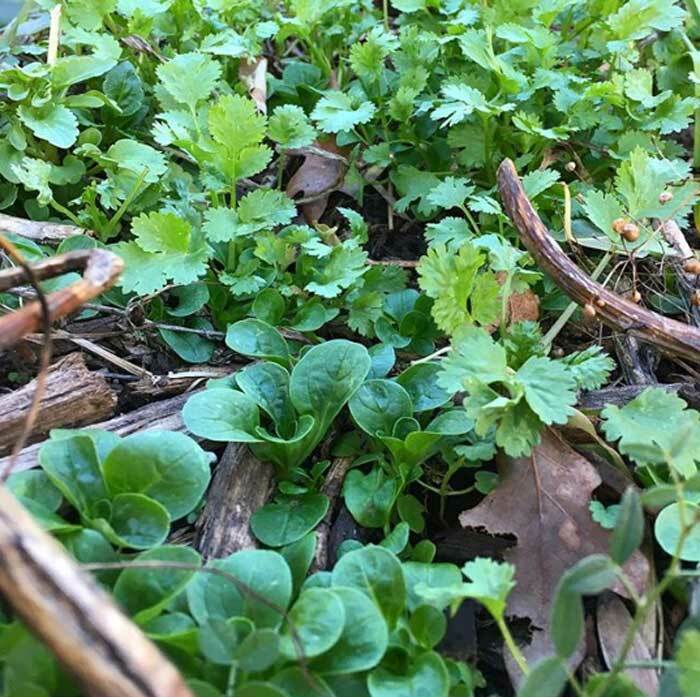 As with cilantro, our parsley patches keep trucking through single digit winter temps. Fresh parsley tastes so good we often eat it raw in the garden. Want to make your other winter veggies taste even better? Add fresh parsley. Here are roasted carrots and parsnips garnished with fresh parsley and finger lime pearls. Scallions, Bunching Onions, and Green Onions are usually just different names given to the same cold-hardy plant. It’s awfully nice being able to walk out your front door to snip fresh ones whenever you need them. Even if the greens die back to the ground during extreme cold weather in the north, they’ll pop right back up as soon as the ground thaws in spring. Since we eat so many alliums, we always have perennial patches of these onion plants growing in containers and in our front beds for easy access. A great way to add flavor to any salad or dish is with a garnish of freshly-harvested green onions. You can see a generous topping of diced scallions applied to this wintertime mixed green salad. We hope our list of the easiest garden plants to grow in the fall and winter helps you garden straight through the cold months. Obviously, we didn’t include EVERY edible cold weather garden plant available, and there are plenty of others for you to explore. 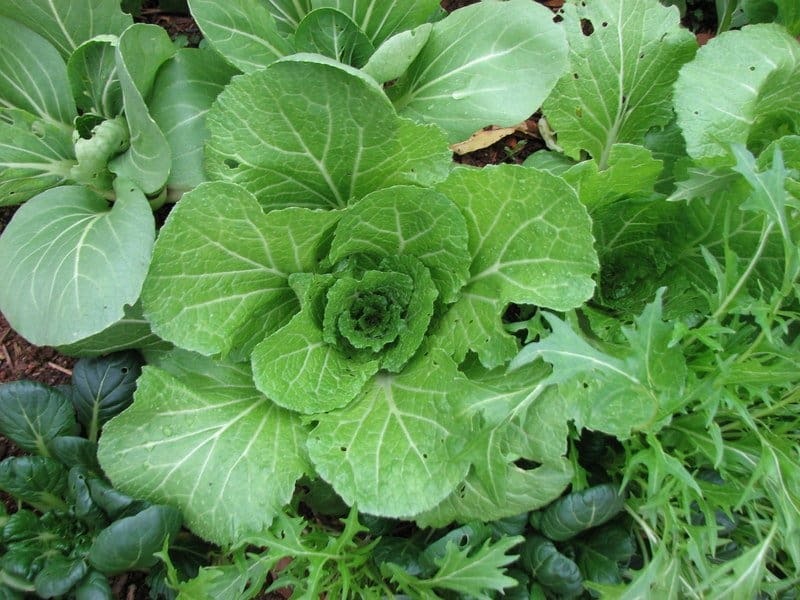 Beautiful greens growing in winter under “low tunnels” in our garden. Low tunnels are super easy to install and very inexpensive. They pay for themselves many times over in a single year due to the increased yields they allow. 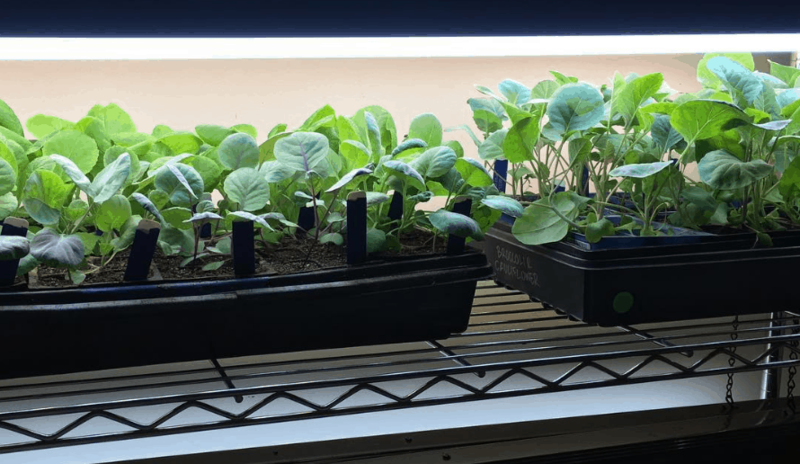 Also, if you get really serious about growing lots of your own organic food year round, you might want to check out our How to Make Your Own DIY Grow Lights article. 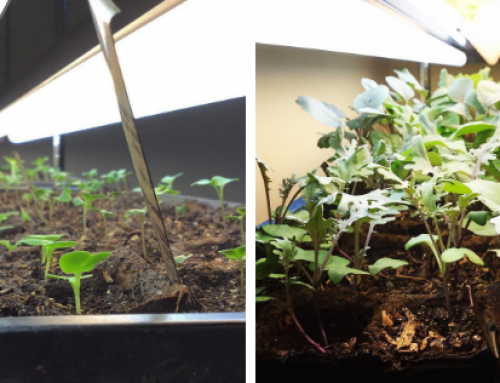 Another great tactic for improving your fall and winter garden yields is to start your own seedlings under an indoor grow light setup. 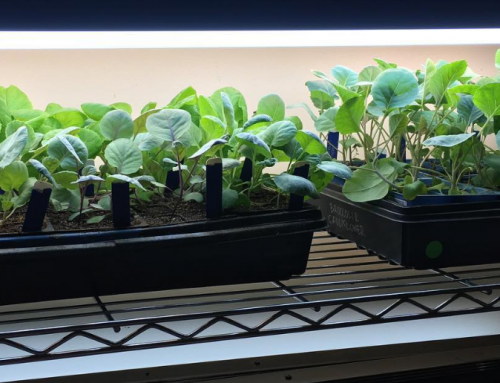 Here you can see lots of fall and winter veggie seedlings we started under grow lights. GrowJourney's Creative Director, Susan von Frank is a true Renaissance woman. In addition to our web and graphic design skills, she's an organic gardener, plant geek, and heritage breed duck mom. Susan also has a strong science background, having earned a B.A. in Biology from College of Charleston, worked as an ACSM certified personal trainer, and as a research assistant in addiction psychiatry at Medical University of South Carolina (MUSC). Foraging, cooking, fermentation, and mixology round out her other interests. In addition to her work with GrowJourney, Susan and her husband Aaron also blog at TyrantFarms.com.